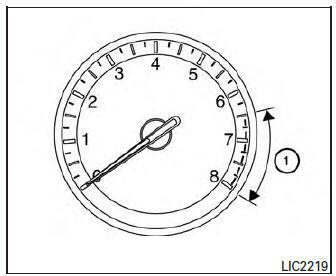 The speedometer indicates vehicle speed. 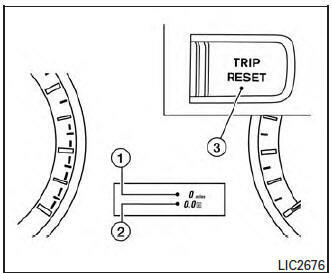 The odometer 1 and the twin trip odometer 2 are displayed below the Vehicle Information Display when the ignition switch is placed in the ON position. Pushing the TRIP RESET switch 3 for more than one second resets the currently displayed trip odometer to zero. 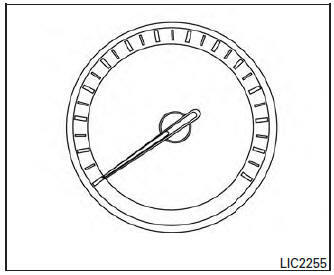 The tachometer indicates engine speed in revolutions per minute (rpm). Do not rev engine into the red zone 1 . When engine speed approaches the red zone, reduce engine speed. Operating the engine in the red zone may cause serious engine damage.